Food is so much more than what’s on your plate. It can also be a revealing glimpse into history and culture. 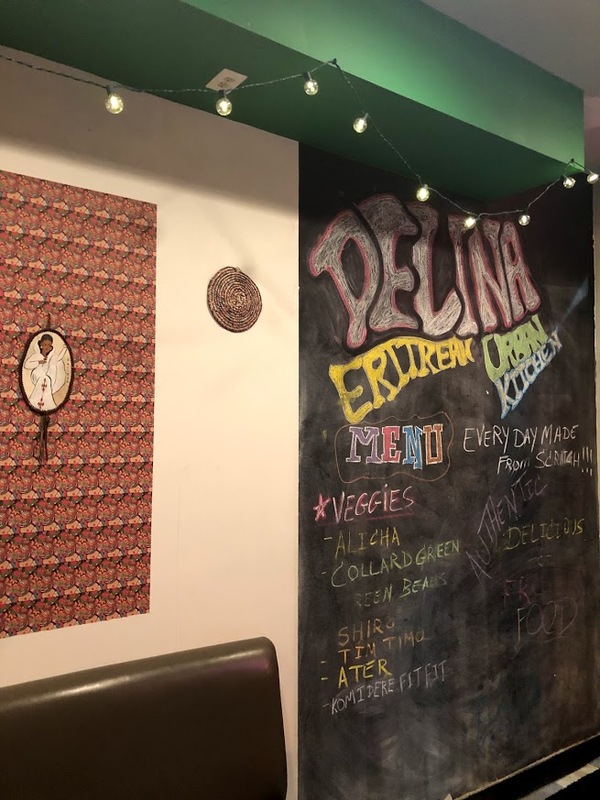 Delina Eritrean Urban Kitchen, a recent addition to Bethesda, is a prime example. Delina is named for the 10-year old daughter of restaurant owners Abraham and Martha Melles. Martha serves as Executive Chef, alongside Chef Abeba Bisetegn. It’s a casual spot, open for lunch and dinner. 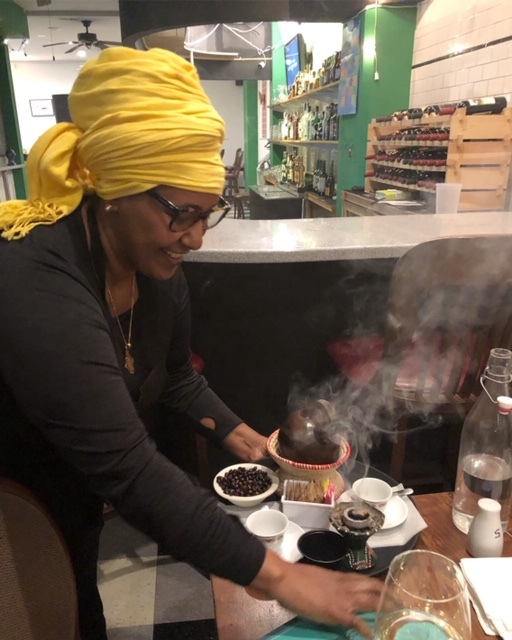 I’m unfamiliar with Eritrean cuisine, and so I invite Tambra Raye Stevenson to join me on my culinary journey at Delina. Tambra founded an initiative called WANDA: Women Advancing Nutrition Dietetics and Agriculture to empower women and girls to lead and create healthy communities in Africa and the Diaspora. Tambra brings with her a knowledge of African cuisine and a passion for food history. Delina general manager, Deres Asgedom, helps us navigate the menu. He explains that Eritrean cuisine is akin to Ethiopian, but unique ingredients reflect the country’s colonization by Italy including more tomato-based dishes and pasta. There are more similarities between the cuisines than differences, Asgedom explains. 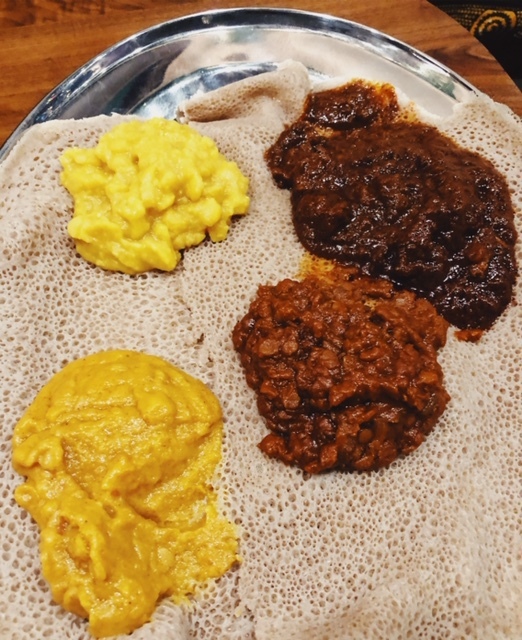 Most obvious is the fact that both countries embrace a tradition of dispensing with utensils and using injera, a spongy flatbread usually made from teff flour, as a vehicle for the food. Asgedom shares that he left Eritrea as a teenager to escape war with Ethiopia, and peace has only been fully achieved in his country very recently. Her words make me rethink my attitude towards injera. I’ve never been enamored with the consistency, particularly the way it expands and is remarkably filling. I set this aversion aside and immerse myself in the experience. Bring on the injera. Lots of it. Portions at Delina are small, and it’s recommended that diners order three to four dishes per person. However, most range in price from $4 to $5, so ordering more isn’t a big stretch if you’re particularly hungry or want to explore more of the menu. Dishes are brought to the table in small bowls, and most are deposited onto an injera covered platter for sharing. More injera is served rolled up on a plate. 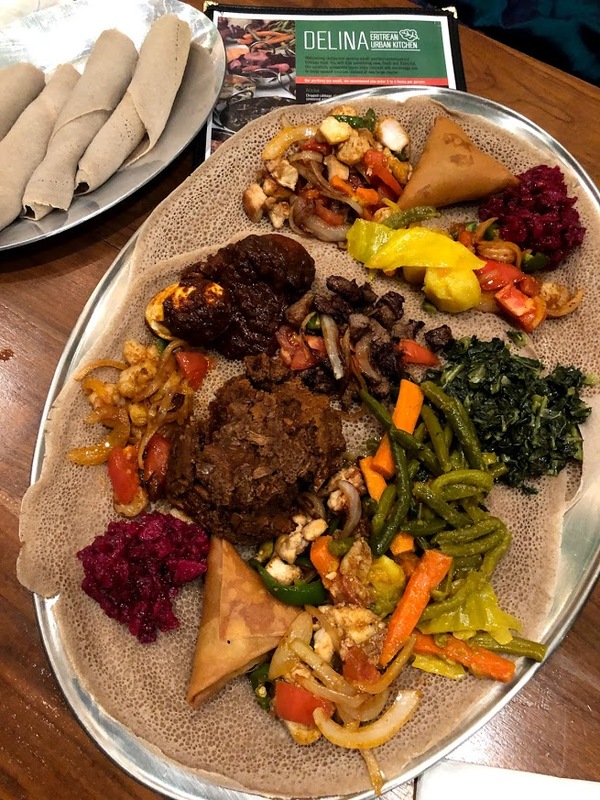 Eritrean cuisine features an abundance of vegetables, and the menu at Delina reflects this with nearly a dozen vegetable dishes. Collard greens with onions, green beans with garlic and ginger, and beets and potatoes with jalapeno, represent the cuisine in a way that’s not intimidating for diners who want to venture slowly into unfamiliar territory. I find it more interesting to explore dishes with names I don’t recognize. Shiro is a soupy mash of roasted chickpeas with red onions, garlic, and tomato. Tim Timo is made from red lentils simmered in berbere spice with tomatoes. Komidere Fit-fit combines tomatoes with jalapenos, onion, garlic, and torn pieces of injera. Yes, you use your injera to pick up this injera-laden stew. A variety of spices amp up the food. Berbere is the most common. It’s a spice blend that includes chili peppers, cinnamon, garlic, ginger, basil, and fenugreek. Many of the items are spicy, but flavors are balanced, and there’s no lingering burn. Some of the vegetable concoctions have a watery consistency that cause them to slide off the injera. Therefore, perseverance in perfecting the scooping technique is a must. Meat dishes fall into two categories at Delina: Tsebhi and Tibsi.Tsebhi are spicy stews, rich with garlic, ginger, butter, and berbere. Zigni is a beef stew with tomato sauce. Tsebhi Dorho consists of a single chicken drumstick and a boiled egg served in a thick and tangy brown sauce. I can’t begin to tackle this with injera, and decide to turn it into finger food. Tibsi dishes feature chicken, shrimp, mushroom, ground fish, or lamb sautéed with onions, garlic, and tomatoes. Ordering a combination of Tibsi and Tsebhi provides a lively contrast of textures and flavors. Ethiopians and Eritreans consider coffee an important conclusion to a communal meal. The coffee ceremony involves the roasting of beans at the table, which ensures an intoxicating aroma that’s difficult to resist. Chef Bisetegn pours the coffee from a clay pot known as a jabena, transfixing us in the process. As I navigate back and forth between meats, grains, and vegetables, I realize that this isn’t about one dish outshining the other. It’s about all of the ingredients coming together to form an immensely satisfying meal. And at its essence is injera- which starts off being about function- but really is so much more. Frederick Restaurant Week: Happening Now!